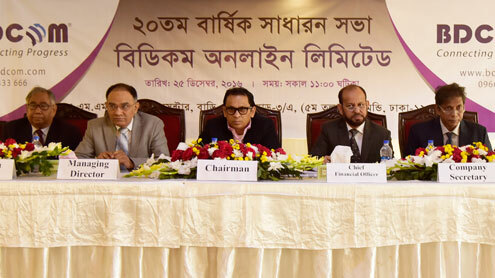 The 20th AGM of BDCOM Online Limited declared 5% Cash & 7% Stock Dividend. The 20th AGM of BDCOM Online Limited was held on Sunday December 25, 2016 at AMM Convention Center. Chairman of the Company Mr. Wahidul Haque Siddiqui presided over the meeting. Managing Director Mr. S.M. Golam Faruk Alamgir, Director & Independent Director & a large number of Share holders attended the meeting. BDCOM declared 5% cash & 7% Stock Dividend for the year ended 30th June 2016. Audited Financial Statements, Auditors Reports and Directors reports thereon for the year also adopted in the meeting.